This species is usually found in the wet hollows beneath dry tussocks on heath and moorland. 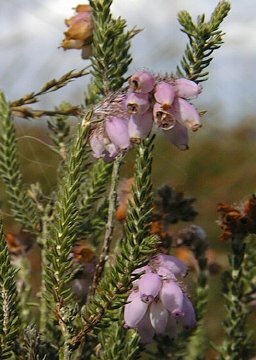 Often found next to Bell Heather on the drier tussocks, Cross-leaved Heath differs by having larger, pale pink flowers. The plants grow to a height of 40cm and have whorls of four leaves up each stem. Flowering season is between July to September.